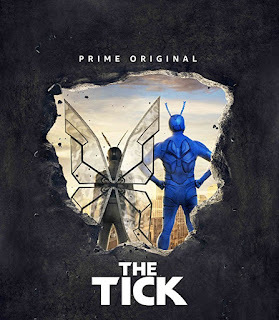 Yes fans, The Tick is returning for his second session, season 1B (the second six eps) on Amazon Prime and this time around, well, that dead villain is seemingly wreaking havoc! And he'll be doing so on February 23rd, 2018! "The Tick returns with more action-packed episodes! Evil is on the march, and The City is right in its way. Something terrible is going to happen, and Destiny needs her champions now more than ever. The Tick and Arthur round up the gang in a crash collision course between justice and villainy. Stream new episodes 2/23 on Prime Video. About the Tick: In a world where superheroes have been real for decades, an accountant with mental health issues and zero powers comes to realize his city is owned by a global super villain long-thought dead. As he struggles to uncover this conspiracy, he falls in league with a strange blue superhero." That's right... there's a spoon in this trailer! OH, BTW, The Tick was renewed for a 10-episode, second season by Amazon.